From this conviction came her vision of bringing together children from all over the globe to learn to respect different and common values. 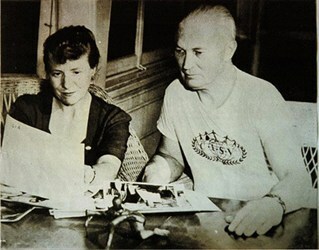 In 1951, she realized her dream when delegates from eight countries gathered in Cincinnati, USA for the first Children’s International Summer Village (CISV). The Detroit chapter was founded soon thereafter. Here’s a short video about Doris Allen. Over the decades, CISV grew in numbers, countries and activities. In 1979, Doris Allen was nominated for the Nobel Peace Prize – the recipient that year was Mother Teresa. Over 50 years after the first Village, this program remains the cornerstone of our international educational activities. CISV’s range of programs has increased from one to six different types of international activities and from one village to around 180 international programs a year. Today CISV operates in over 70 countries and since 1951, more than 190,000 people have participated in more than 5000 international activities. In the Detroit area, some families have been active in CISV for three generations.